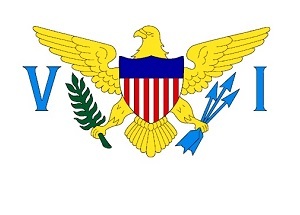 The Virgin Islands of the United States, consists of the main islands of Saint Croix, Saint John, and Saint Thomas, and many other surrounding minor islands. The total land area of the territory is 346.36 km2. Previously known as the Danish West Indies of the Kingdom of Denmark, they were sold to the United States by Denmark in 1916. They are classified by the United Nations as a Non-Self-Governing Territory. The islands were named by Christopher Columbus on his second voyage in 1493 for Saint Ursula and her virgin followers. Over the next two hundred years, the islands were held by many European powers, including Spain, Great Britain, the Netherlands, France, and Denmark. The population is just above 106.000 of which Black or Afro-Caribbean count for 76.0%, White 15.7%, Asian: 1.4% and Mixed: 2.1%. Around 95% are Christians. The United States Virgin Islands enjoy a tropical climate, with little seasonal change throughout the year. Here are 144 species of birds, 22 species of mammals, 302 species of fish and seven species of amphibians. The only endemic land mammals are six species of native bats: the greater bulldog bat, Antillean fruit-eating bat, red fruit bat, Brazilian free-tailed bat, velvety free-tailed bat and the Jamaican fruit bat. Reptiles manages better: The world’s largest species of reptile, the leatherback turtle, as well as one of the largest land lizards, the green iguana thrives here along with the red-footed tortoise. I would like to see the Virgin Islands worm lizard; Amphisbaena fenestrata. 14/3 2019. I got an early flight from Puerto Rico at a bit after ten, I'm on St. Thomas. I have chosen not to rent a car here, as I will be island hopping, and it mainly is a visit to the towns. Never the less, I walk the five kilometres from the airport to my hotel in the centre of Charlotte Amalie. Within ten minutes after touch-down, I have my toes in the blue water at the beach. The first part is not that interesting; it is mainly industrial buildings, although small. Further inland, the high hills are dotted with nice houses. Then I pass Nisky Moravian Church, a billboard for Captain Morgan, a grave yard and then a little fishing harbour. The water is packed with barracudas well over one meter - where the fishermen spill their guts. Then I pass a official looking building with an American flag, the US Virgin Island's flag and what most likely should be a Danish, although it is a bit narrow in the white. When I reach the older Charlotte Amalie, I turn into the narrow streets. Here, it seems like 90% of the buildings are dating back to the Danish ruling. Most are now shops with the most expensive jewellery and fashion of the world. The buildings look like the few remaining old houses in the small trading towns in Denmark, with arches and shutters for every opening. A few palm trees do spoil that, but add to another even greater atmosphere. I eventually make it to my hotel, but a bit too early. It is in the dead centre, but one street back, where it is way more quiet. I drop my bag a the office, and head a bit inland. Here, the old houses continues, although they get smaller and more wooden. And the time seems to have been harder on them. Here are a few pigeons but a lot of hens. Even down in the main street; Kronprinsessens Gade, you see hens. And the streets names are Danish most of the way: Norregade, Vimmelskaftet, Krystal Gade, Nye Gade, Dronningens Gade, Ny Tvaer Gade, Vester Gade and so on. As I walk inland, I find a little joint, offering falafel wraps for $5, and it is great! I start making photos o the greater buildings, but hare are way too many - and the streets too narrow. I have a few sights here, but right now, I just enjoy walking these old Danish streets and see the buildings. I see a single Iguana on a pole, but i guess there will be more in the hills. They seem to be blind to cars. Incidentally, I pass the old Danish Fort Christian. It is dark red and real well preserved. It was build by Danish bricks, brought here as ballast. Some other old governmental buildings are found in the area, next to the sea. I make a tour inside the fort, and see the dungeons where the slaves were brought, the commandants quarters and all the other rooms. Of cause, it offers a great view to the harbour. Back on the street, I find a roof top cafe, offering a nice lemonade and tea. I watch the busy road along the waterline and the breeze. Then I enters the city again, on what the business people call a really quiet day. Well, hare are hardly room for more cars, but I'll give them: I don't need the 25 souvenir stands all to my self. Especially as they have nothing handiwork at all. I do the promenade all the way out of town, and return then by Kronprinsessens Gade, although I have no desire to buy either Gucci, Versace, Rolex, Cartier, Hublot, Mont Blanc, Rado, Armani, Dolce & Gabbana, Prada and least of all Pandora! But I love the houses they are sold from. A bit after five, I'm hungry, but it is just as the restaurants have closed! I finally find a bar/restaurant, serving a chickpea burger. It is tasteless as no spices at all, and I think they have cooked the "beef". I get s thin lemonade, and are supposed to pay US$23,50 plus at least 10, but more likely 20% tips. Well, I can't get that to more than 25, and I still feel cheated! I prefer wraps! 15. I wake up on St Thomas, but head straight over the island to the St John ferry. The bus drive give me a good feeling of, what I can expect to see on the central part of St Thomas. And here is nothing really interesting. Scattered buildings, small bush-overgrown hills and nothing else. Further east, it is a proper city again, but without the charming old houses. I miss the hourly ferry with a few minutes, but that give me time to explore the eastern part of St Thomas; Red Hook. Here are a harbour, a town and some coastline. Again, the bush-covered hills are dotted with fairly nice houses. Here are quite some ferry lines, some even the the British Virgin Islands. Some are real post catamarans, other old diesel beasts - like mine. I jump off at Fort Christian, and walk straight to my favourite restaurant; the little wrap shop. I do another our around the neighbourhood while he prepare my supper, and see some more old and small wooden huts and free-ranging hens. Then, it is time to go home and work. 16 . I'm up early to take advantage of the low morning light. I wander around Charlotte Amalie to see some specific buildings, and the rest while I'm here. My first target is the Government House, which is being rebuild inside now. It have a little square with a fountain and a great view in front, and a traditional Danish sentry box in front. Next to it is the 99 steps - and four extra. One of the many staircases scattered around the city. At the end of this staircase, Blackbeard’s Castle is found. It is only by name, and it is only a little round tower, and I'm not going to wait for them to open, and pay $15 for a guided tour! From here, I walk through the old town, some streets in and up the mountain side. Some houses are still impressive, others could use some paint - and a roof. I get way too high, but the old wooden houses and neighbourhood is lovely. Eventually, I find mu way down to the seaside and then Frenchtown. They even speak French here, although an old form. Besides from having the little harbour I saw when I walked in from the airport, here are little of interest. I follow the sea back - or a street or two in, and stop to charge the GPS at the hotel, grab a wrap and then I'm ready for another adventure. I have decided to investigate the other side of the island. On the other side of the 500 meter high mountain, Magen's Bay and it famous beach is found. It is said to be the best beach in the Caribbean. I had actually hoped for a bus, but despite I meet several, none is driving my way. It is a real steep climb, and the sun is straight in on the mountain side. On the bright side, it offers some great views over the bay. When I eventually make it to the top, Drake´s Seat offers a great view over the northern coast and Magen's Bay. It is, by the way, for sale; $45 millions. Not bad, but the entrance fee is only $5, and it is fare from packed. I start with some water and a fruit punch, then I walk to the northern end. It is a perfect, white beach with the perfect depth and wave, all 500 metres. In each end, some volcanic rocks are covered in bushes and huge cacti. Behind the big parking lot, a mangrove is found. I walk to the southern end in the water, and watch the brown pelicans. 17. I have nothing special lined up for the day, until my 16;30 flight. I just wander around the huge old town, desperately trying to find new motives. It is a real quiet day, and I'm able to get a few pictures without cars on. I get up the foothills with the small houses, down at the promenade and the blue sea, into the huge old Danish governmental buildings and the fortress and everything in-between. I make a pit-stop at a rooftop for a tea, and in the shop underneath to give her a tip on Dominican Republic Taino wood- and bonecuttings. I could buy them for 30 c, she can sell them for $10 - at least. And it was Tainos, who lived here too. Pass noon, I make it pass my wrap-man, then back for a long chat with the hotel owner. At two, I catch a bus to the airport. He actually drive me all the way, as he doubles as a taxi, and have a pick-up. Two hours of waiting, but I got pictures to process and diary to write. Strangely enough, there are no security check at all! A first in many, many years, but this is the US!?! It is only half a hour flight in a SAAB 340B, and I'm on St Croix and in Diary 3.